In my initial article on house-price-to-rent ratios, I looked at how major US markets compared to each other in terms of one of my favorite real estate value metrics – price / rent (using Zillow’s ZHVI / ZRI as a standin). In part II, I examined recent trends by region for that same metric. Now I want to look at trends going back before 2007 to evaluate if we’re in a new housing market bubble. Spoiler alert: I don’t think we’re in a bubble because, like lighting, bubbles don’t strike twice. The reason? Bubbles are a psychological phenomenon where people forget underlying value as they bid up the price of a certain asset (think Pets.com, tulips, etc.). A burst bubble will inoculate the public against the next bubble. Sure, a bubble could move from one asset class to another, but two bubbles in the same asset class within 10 years doesn’t seem possible. First off, let’s find a base month to examine our data. 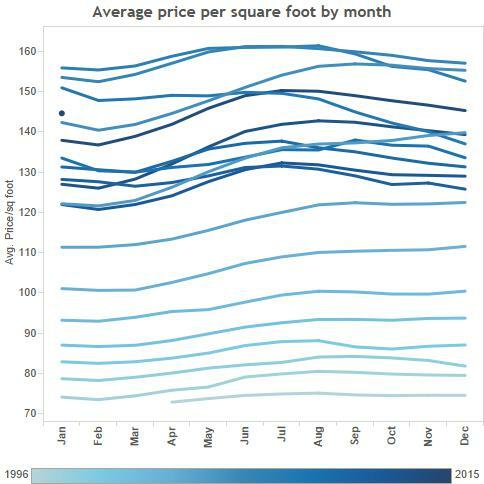 Recently an agent told me that the season didn’t effect house prices, but I had a feeling he was wrong. Sure enough, looking at the graph below by month, it sure does looks like there’s a strong seasonal trend in prices (with a peak sometime in the summer). Now that we have that squared away, let’s identify the peak in housing prices. 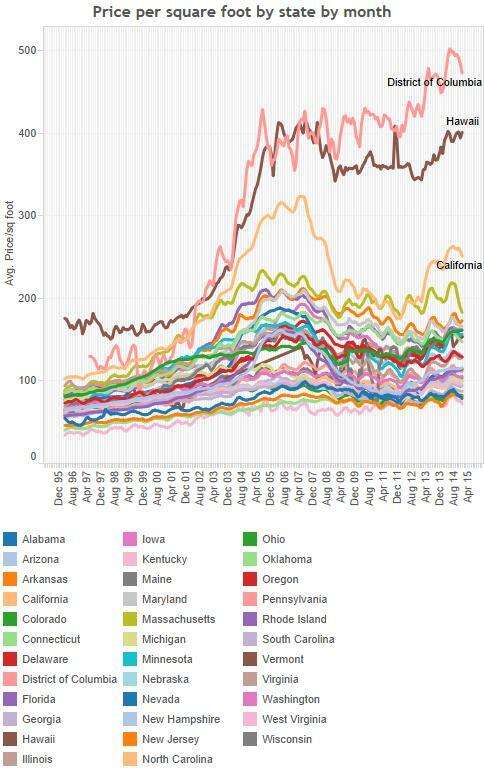 Averaging all the states together gives us August 2007 as the peak. But if we break up our trend by state, we see some interesting patterns. First of all, Hawaii and DC didn’t experience a bubble at all. They just had an upwards price adjustment followed by a fairly flat price/square foot. The other data are messy, but we can see a variety of trends hidden below the headline number. Below are trends that stick out for being (maybe) bubbly or abnormally non-bubbly. 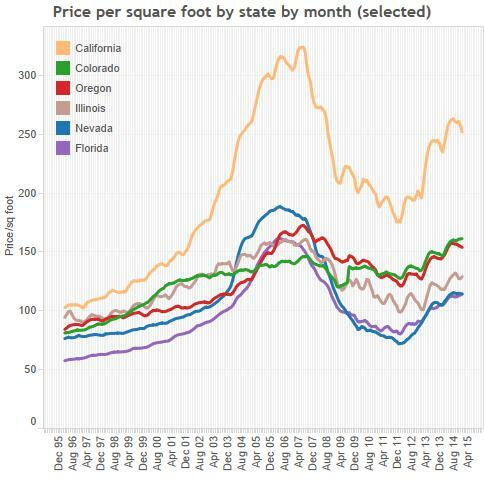 California and Oregon look kind of bubbly, but also like prices outdid a positive linear trend, fell back, and are now regrouping to saner highs. This is in contrast to Nevada and Florida, whose patterns look more like typical bubbles (albeit with some recent recovery). Colorado looks positively sane with no massive uptick and a slight downward slide, followed by another reasonable uptick. Illinois didn’t have a huge run-up before 2007, but seems to have suffered since (bad governance, anyone?). What about a map to see where we are in August 2014 vs. the peak month in August 2007? Again, the west and Florida look weak when compared with the “bubble” years. 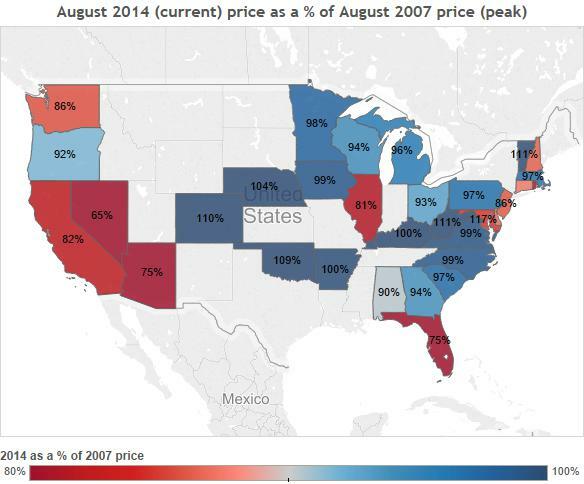 But Illinois looks almost as bad, albeit without the massive price rise pre-2007. And a lot of states are at (or past) their August 2007 peak. In 2007 I recall thinking that, yes, we did have a housing bubble. But in retrospect, some areas like Nevada, Arizona and Florida may have had a bubble, but the rest of the country did not. Markets are pretty efficient, especially in today’s hyper-velocity-information environment. It’s hard to see how prices could get so far out of whack. Looking back on these last 20 years, it looks like instead of a housing bubble, economists like Scott Sumner were right. We really had a massive failure in monetary policy to support nominal GDP growth.